Gwrach Ynys is an Edwardian country house set in open countryside, two miles to the north of the historic town of Harlech, in an area of outstanding natural beauty, within the Snowdonia National Park. 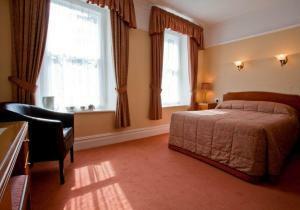 It is situated in a splendid location, nestled between the Rhinog mountains and the sandy beaches of the Cardigan Bay. The house is surrounded by over an acre of lawned gardes with mature trees, from where guests can enjoy panoramic views from the summit of mount Snowdon to the north to Harlech Castle to the south. Two miles north of Harlech on A496. The house is set in open countryside, two miles north of Harlech on the A496. It is surrounded by lawned gardens, which are fairly level. Car parking is to the side of the house on level tarmac. The furthest you would have to walk is 30 metres ( 33 yards ), and there is a space to the front which is 5 metres ( 6 yards ) from the front door. There are two steps leading to the front door. The first is 100mm ( 4 inches ) onto the veranda and the second, into the house, is 180mm (7 inches ) high. Once inside, the ground floor is level, and we have the dining room and guest lounges. There are no toilets or bedrooms on the ground floor. All our bedrooms are on the first floor. The staircase is 900mm ( 35 inches ) wide with a solid banister. There are 12 steps of 180mm ( 7 inches ) to reach a small landing. Three further steps of 180mm ( 7 inches ) lead to the back bedrooms or four further steps of 180mm ( 7 inches ) lead to the front rooms. 6 of our bedrooms are en – suite, one with a bath, and the other five with showers. All the showers have enclosures. The stairs and landings are well lit. All our bedrooms have cordless kettles, and remote control televisions. A bus service passes the house every hour, during the day, and buses will stop by request. The closest train station is at Harlech, two miles away. Mobile phone coverage on Vodaphone / Cellnet / and Orange is good in the house and immediate vicinity, but there are many spots in the surrounding area where reception cannot be guaranteed.